Contact Us, Careers, News, Contract Vehicles, Global Experience and Solutions – Control the background image and content for the sections above the footer. 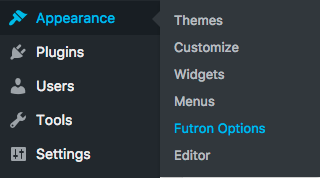 login Login To Futron Inc.
[news_and_tweets] – Returns the 60/40 Section with News and Twitter Feeds. This Shortcode should be used in a ‘Full Width Stretched’ Row. Pagebuilder allows you to, with more control, style your pages. to go to the PageBuilder styler go to the Page Builder tab on the top right of the editor. Instructions can be found here. Contract Form 7 is used for the Contact page. Wp Job Manager manages the Job Opportunities. Instructions can be found here. Contract Type – Description will show up on Solutions Page when that Contract Type is selected. Partners – Partners show up on the Solutions page. Extra Data – Each Post type has extra fields that you can fill in. Default Pages and News Posts include options to add a Hero Image and text. The background image for the hero pulls from the page or posts Featured Image.